In ICT, the children have made good use of both the i-pads and Mac books this term. 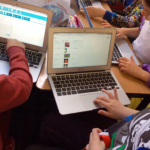 They have written emails to each other, used Powerpoint for presentations and HWB resources like Encarta, researched information to add to their databases, recorded conversations in Welsh and customised their own scenes and characters using Puppet Pals. They’ve done all this, as well as frequently using the i-pads for research purposes.